Trying to figure out your “hook” for college admissions? In general, a hook refers to the element of your college application that makes you stand out from the crowd. It’s what will make the admissions office “bite” on your application. But not all hooks are the same. I think there are three types of college admission hooks. Actually, it’s probably better to say that there are three types of hooks that college admissions offices generally recognize. The first class of hooks consists of students with attributes beyond their control. You were either born with them or not and there’s nothing you can do to change it short of being adopted. By the time students reach the college application process, there is generally little that can be done to acquire the second type of hook. These hooks require time to develop and by the time students reach to high school, they generally either have them or they don’t. The third type of hook is the one where students can develop it on their own in high school. There’s just no telling if an admissions committee will find it compelling. The first hook is a pretty well-defined class of students that colleges recruit. The hook these students bring is something the student actually has no control over. The traditional hooks for this group consists of legacy students, development students, and under-represented minority students. Development students are by far the smallest group in this category. They’re students whose families can and will endow a gym, library, or new science lab. They are such a small group that they don’t really affect the general applicant pool. The legacy group consists of students who have a close family member, usually a parent, who graduated from the college the student is applying to. For highly selective schools, applying as a legacy can increase your chances of admissions by up to 45 percentage points. The under-represented minority students group is probably the hook that gets the most attention. Studies show under-represented minorities have higher chances of being admitted. 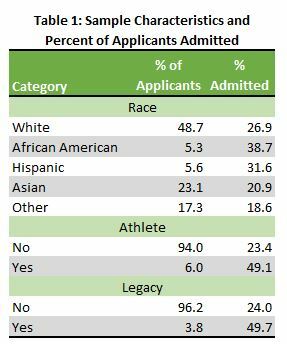 However, the most recent studies suggests being a legacy does more to increase your chances of admissions at highly selective colleges than being an under-represented minority. The next type of hook is a group that will have more variability from year to year and school to school. This group consists of recruited athletes and full-pay students. The value of being a recruited athlete will depend on how much influence the coach has with admissions. Usually, athletes must apply early decision to receive the full benefit of the coaches influence. Being a full-pay student generally doesn’t count as a hook until a college is filling the last slots for its freshman class. Given that there are relatively few competitive private colleges that are need blind in admissions, the last students admitted to a class are much more likely to be full-pay students than those with financial need. Students with these hooks generally acquire them before reaching high school although that isn’t always the case. Some athletes are capable of developing overnight and anyone can inherit money right up to the time of submitting the FAFSA. Yet in most cases, these hooks are already being developed by the time students enter high school. The third type of hook is the “uniqueness” quality of your application. It’s what makes you stand out from the other applicants to the school. This hook has two categories. The first is based on institutional needs. If an engineering school is looking to increase the percentage of women in the class, being female is a hook for the school. If a Florida college is trying to increase the number of out-of-state students, being from Alaska may be considered a hook. The second category consists of students who just stand out from other students because of their accomplishments and interests. The truly effective hooks are independent of the usual classifications. In other words, being the president of a club, valedictorian, team captain, youth group volunteer, or newspaper editor doesn’t count. Any accomplishment on the national level will be considered a legitimate hook simply because of the level of competition. However, the most impressive hook is something that is created outside the standard scope of the high school experience. The student didn’t just look for something to join and then climbed to the top; the student created something substantive that wasn’t there before. This isn’t necessarily as hard as it sounds. It does require taking the time to look around and finding things that interest you. I recommend reading Cal Newport’s Study Hacks for more ideas about getting noticed in college admissions. Just remember, the college admissions hook concept is irrelevant at the majority of colleges and universities. Most state institutions admit on some combined requirement of test scores, GPA, and class rank. And merit scholarships for most private colleges are based on similar requirements. Your hook is only an issue at some of the most highly selective schools. And even then, some schools such as MIT don’t grant any special consideration to legacy, athletic, or under-represented minority status. Ultimately, if your hook is something that you try to put together just to get admitted to college, it probably isn’t a hook.